Nationals Series Starts Tomorrow - Scheduled Autograph Signings, Game Give Aways and Other Stuff! 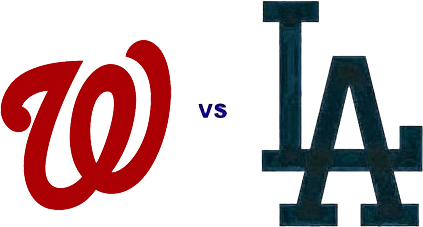 The next homestand starts on Monday against the Washington Nationals, and several olde-tyme Dodgers will be in the house to sign free autographs for fans. Below are the scheduled autograph opportunities and other odds and ends for this upcoming homestand. BTW, the Extreme Loaded Dog concession stands will be making the Washington Dog, an all-beef hot dog wrapped in Virginia Ham. It will be available Friday through Sunday at extreme loaded dog concession stands on the Field, Loge and Reserve levels. Happy Labor Day! Monday's game starts at 5:10 PM. Auto gates open at 2:30 PM, and stadium gates open at 3:00 PM. 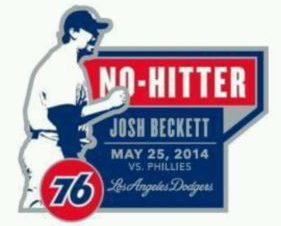 This afternoon the Dodgers celebrate Josh Beckett's No-Hitter. The first 40,000 fans will receive an Beckett Commemorative No-Hitter Pin. Check it out on the right. As part of his 27,273-mile media tour, Manny “Pacman” Pacquiao, eight-division world champion in boxing, will throw the ceremonial first pitch on Monday. The Filharmonic, who appeared on NBC’s “The Sing-Off,” will perform prior to Monday’s game and will also sing the national anthem. 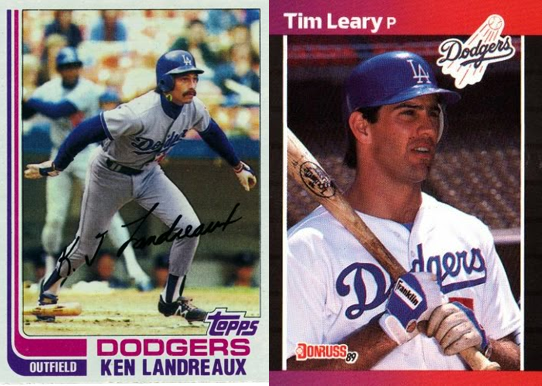 Former Dodgers Tim Leary (in right-field pavilion plaza) and Ken Landreaux (in left-field pavilion plaza) will be signing autographs for fans from 3:00 PM to 5:00 PM. The Veteran of the Game presented by Bank of America is U.S. Marine Corps Sergeant Leon Pierce of Los Angeles. Pierce enlisted in 2002 and served with a Mortar Platoon maintaining personnel and equipment and ensuring his unit was mentally and physically prepared for combat operations. While deployed at Camp Leatherneck in the Helmand Province, Afghanistan, his vehicle was hit by an IED where he sustained several injuries. He is now recovering at the Wounded Warrior Battalion West, Camp Pendleton and hopes to attend SDSU to become a trauma nurse. Pierce’s accolades include the Purple Heart and the Iraq and Afghanistan Campaign Medals. Bank of America Senior Vice President Global Commercial Banking Felix Whittaker will present Pierce with an authenticated flag that has proudly flown over Dodger Stadium and display case. Tueday's game starts at 7:10 PM. Auto gates open at 4:30 PM, and stadium gates open at 5:00 PM. It is another Dodger bobblehead day. The first 50,000 fans will receive a Magic Johnson Bobblehead. See the bobblehead on the left. Dodgers Radio AM 570 Fox Sports LA’s Petros and Money show will broadcast live from the left-field pavilion plaza. R&B singer Jeffrey Osborne will perform the national anthem. 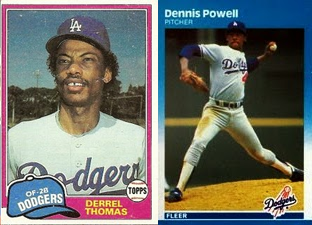 Former Dodgers Dennis Powell (in right-field pavilion plaza) and Derrel Thomas (in left-field pavilion plaza) will be signing autographs for fans from 5:00 PM to 7:00 PM. The Veteran of the Game presented by Bank of America is U.S. Marine Corps Sergeant Wyatt Waldron of Palmdale. Waldron was a 50 Caliber Heavy Machine Gunner with the 3rd Battalion 4th Marine Infantry and served three combat tours in Iraq. In 2004, his unit fought in the battle of Fallujah, Iraq, and pulled down the statue of Saddam Hussein. Waldron’s accolades include the Purple Heart for injuries he sustained from an IED blast, two Marine Corps Medals with Valor and the Silver Star. Wednesday's game starts early at 12:10 PM. Auto gates open at 9:30 AM, and stadium gates open at 10:00 AM. Singer and songwriter Kim Devine will perform the national anthem. 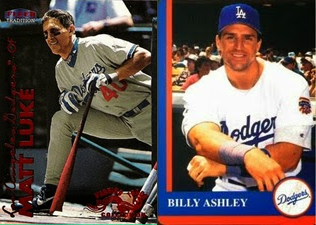 Former Dodgers Billy Ashley (in right-field pavilion plaza) and Matt Luke (in left-field pavilion plaza) will be signing autographs for fans from 10:00 AM to 12:00 PM. The Veteran of the Game presented by Bank of America is U.S. Air Force Staff Sergeant John Smith. In 1961, after hearing President John F. Kennedy’s first inaugural speech in which he stated ‘“Ask not what your country can do for you; ask what you can do for your country,” Smith enlisted in the Air Force and served at the School of Aerospace Medicine at Brooks Air Force Base doing medical research. Just another tough loss for the Dodgers last night. The Padres are showing that they are a team not to be ignored. Sure, they can't hit a lick, but when you can send out hurlers who can pitch effectively it means you are always in the game. Given some time and proper development we could see this franchise become relevant again. BTW, four heirs to former Dodgers owner Walter O'Malley are part owners of the Padres, so the focus on pitching shouldn't be a surprise. The Dodgers won due to pitching, and in a pitchers ballpark like PetCo there's no reason not to start there. Last night, Zack Greinke matched wits and skills with Padres starting pitcher Ian Kennedy. They both gave up just one run apiece and didn't figure in the final decision. Defense ruled the day for the Dodgers. They made some spectacular plays to help their pitchers along; including a diving catch into the stands by Justin Turner. Check out some videos of the more remarkable Dodger defensive plays here, via Jon Weisman at Dodger Insider. 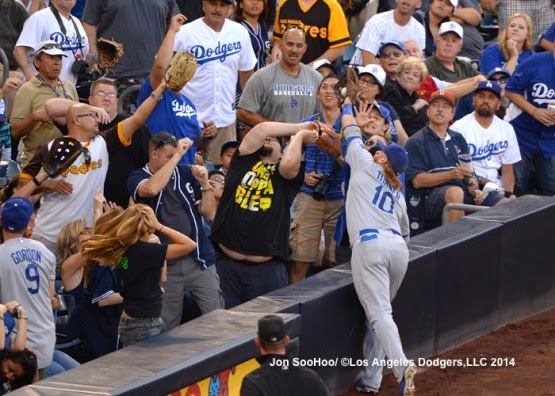 The photo above is of Turner making the death-defying catch, via Jon SooHoo/LA Dodgers 2014. Go here to see more photos from the game. For the second straight game these clubs went into extra innings, and the Padres pulled it out again with walkoff victory. The Dodgers just couldn't capitalize on their opportunities. They left ten men on base, and only scored because Adrian Gonzalez homered to tie the game in the sixth inning. They play their rubber match this afternoon. Hopefully, the Dodgers can salvage the series with a victory. ICYMI, Hyun-Jin Ryu has been activated off the DL to start the game this afternoon. Carlos Frias is option to AAA, but you should expect that too last long. Rosters expand on Monday, and I suspect Frias will be immediately brought back then. Juan Uribe has also been reinstated from the DL and will bat sixth in this afternoons lineup. Infielder Miguel Rojas was optioned, but like Frias you should expect him back once rosters expand on Monday. Via Jon Weisman at Dodger Insider, "Dodgers remain on record strikeout pace." Back in April – admittedly, when the season wasn’t even a month old – I couldn’t help but comment on the remarkable number of strikeouts that were piling up in Dodger games. Via Ken Gurnick at MLB.com, "Bench coach Wallach designed unusual shift." "I started thinking about it the previous at-bat," said Wallach, who left third baseman Justin Turner in his normal spot with the rest of the left side of the infield unprotected. "I thought it for sure was the right thing to do for Smith. Almost every ground ball he hits to the right side." Via Mark Saxon at ESPNLosAngeles.com, "Yasiel Puig slump sparks concern." "The season is long, and it wears you down," Mattingly said. "It's part of learning to regulate yourself here, as far as rest or anything else. We've seen Dee Gordon and how much more consistent his approach is day in and day out now, staying at a certain level. I think Yasiel's really emotional, and it's hard to be really emotional and play 162." Via Bill Plunkett at the OC Register, "Kemp's power is back in a big way." Holy Mackerel! Via Mina Kimes at ESPN The Magazine, "Curt Flood's monopoly man." A single collector has been hoarding 1964 Topps Curt Flood cards for decades, and is thought to own a quarter of all those that exist. His efforts have caused values to be unreasonably high for set collectors. Via Mark Townsend at Big League Stew, "Japanese high school game spans four days and 50 innings." Wha...? Check out this fun fan-made Dodger themed video for the Dropkick Murphy's song "The Boys are Back." Listen to RC Quakes pitching coach Matt Herges talk about Dodger prospect Julio Urias, via ieProSports. David Katz at ThePostGame interviews Clayton Kersahw. He speaks about being an MVP candidate, the Dodgers potential this season, Yasiel Puig's maturity and why everyone should have a 'World Series or Bust' attitude. Via Stadium Bound, listen to Scott Van Slyke give his testimony at Dodgers' Faith and Family Day at Dodger Stadium.